More than just toys for the young and the young-at-heart. About Maileg: Designer Dorthe Mailil and her husband Erik founded Maileg in 1999. They combined their last name Mailil with the Danish word for play: “leg”, and from that, the brand name Maileg was born. Dorthe is a graphic designer, who graduated from the prestigious Danish Design School in 1996 to pursue a career in graphic design. She also took additional courses at Ecole d'Art de Marseille in Paris, France. She is the creator of Maileg’s unique and authentic style. It all began with pixies and the Maileg family has since grown immensely. It now includes bunnies, mice, forest friends, the Ginger family, safari friends and much more. They are all living in a charming world of hand-sewn clothing, modern furniture and playful accessories. Maileg’s collections: Maileg introduces two seasonal collections every year. A Spring/Summer collection and a Fall/Winter collection. The Spring/Summer collection surprises us every year with fun new items. Besides the new stuffed animals that are joining the Maileg family and their adorable toys, furniture and clothes, it also includes new Easter products, like decorations, paper products and collectable Easter figurines. 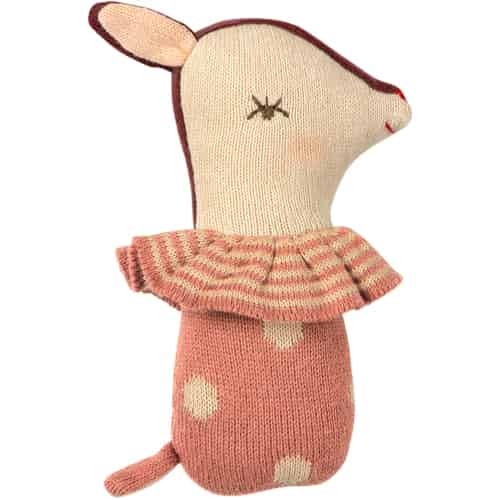 Maileg’s Fall/Winter collection also adds new Maileg animals, toys, furniture and clothes to the ever growing Maileg family. Each year that collection also introduces new mischievous pixies in all sizes and shapes. Christmas pixies are a big part of the Danish Christmas tradition and Maileg does a fantastic job with its detailed designs of making each one look unique. Maileg offers a variety of collectable pixy figurines, pixy advent calendars and pixy plush toys in many different charming outfits. You can also find original Christmas ornaments, decorations and cards in this collection. As you can see: No matter what season, Maileg is always worth a visit in our web shop, because you can find new products all the time. Maileg’s excellent quality and lovely little details in combination with its designer’s fanciful ideas, turn every Maileg product into an extraordinary item, which one will love to collect, give to someone as a special gift, or just keep and enjoy. Follow us into Maileg’s beautiful and imaginative world!